We are seeking an attorney to join our dynamic Legal Advice Line team, which provides assistance to low-income individuals and families in the areas of housing, family law, public benefits, and consumer law. This particular position will focus on our housing practice, which seeks to preserve fair and affordable housing for residents of San José and throughout the Bay Area. The primary responsibility will be to provide advice and counsel to clients on the phone through a call center model. The attorney will also have the opportunity to provide advocacy to low-income tenants by drafting pro per documents, including reasonable accommodation and improper notice letters. The first 2 months of training will occur in Oakland. 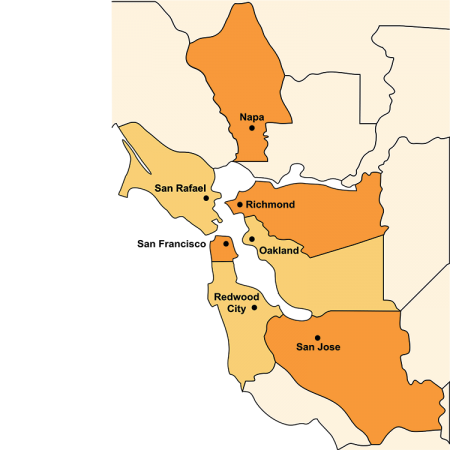 Thereafter, the position will primarily be housed in our Santa Clara County Regional Office, located in downtown San José, with travel required to the Oakland office 1 day a week. Bay Area Legal Aid thrives on our diversity and we are proud to be an equal opportunity employer. We are committed to building a culturally diverse workplace and strongly encourage women, persons of color, LGBTQ individuals, veterans, persons with disabilities, and persons from other underrepresented groups to apply. Review of applications will begin immediately and continue on a rolling basis, but applicants are encouraged to apply as soon as possible. Please send a cover letter, resume, writing sample, diversity statement (see below for details) and list of references to: Human Resources Department, e-mail to jobs@baylegal.org. Be sure to refer to the posting “LAL Attorney- San Jose” in the title of your email. [Please note that your response to the prompt above will not be read by your interviewing hiring committee. To reduce potential bias, your name will be removed and your response to this prompt will be read and reviewed separately from the rest of your application. Feedback on your response will then be provided to the interviewing hiring committee for this position. Therefore, if there is any specific information that you would like the interviewing hiring committee to be aware.